Who’s Lying To You Now? This web site contains information about the classes Tom Tresser has taught and is teaching. In 2019 I started teaching public policy for the National Louis University Master’s Degree program in Public Administration. I am also teaching workshops on civics for The POWER Institute and public forums on “Chicago Is Not Broke” and Tax Increment Financing around the city. In 2017 I taught “Introduction to Nonprofit Organizations” and “Nonprofit Advocacy” for Adler University’s online Master’s Degree Program in Nonprofit Management. He also taught a class on leadership for the Master of Public Administration Program at Adler. He built a class on leadership for Adler’s online Master’s Degree Program in Media and Communications.. I continue to teach “Civics 101” for i c stars three times/year. He is also developing and facilitatinh a workshops on civics for the CivicLab’s POWER Institute (“Chicago 101,” “Grassroots organizing 101,” “Grassroots Campaigning 101,” “TI 101” and “Privatization 101”). For 2016 I served up a new class on nonprofit advocacy for the Adler University Graduate Program in Nonprofit Management. I’m returning to UIC for “Public Policy Advocacy for Social Change.“I look forward to returning to my dear friends at i c stars to teach “Civics 101” to Cycle 35 of their amazing tech training program. I’m also starting to offer my own online webinars! Check out “TIF 101” and get Illuminated! In 2015 I taught a new class on community organizing for Roosevelt University. I was on tap to teach a new class on urban policy in the summer for the Graham School of Continuing Studies. Also in 2015 was an online class on public policy advocacy for social change geared nonprofit managers offered via the University of Illinois at Chicago’s School of Continuing Studies and “Civics 101” for i c stars. 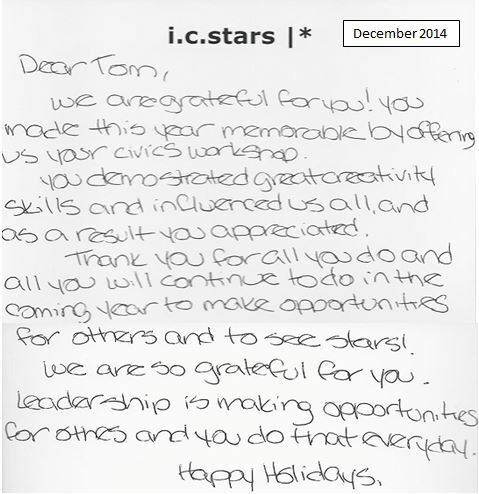 A note from the interns in Cohort 32 from i c stars. You’re most welcome! I really enjoyed the class. It was very thought provoking and the use of the media (music, video, and web) was amazing…This is quite possibly the best put together class I have participated in. Great job! Every once in awhile I take a class that makes me really happy to have shared the time with my peers. The strongest teachers with the best content can only do so much for an individual student if they are unable to work collectively and be challenged by their peers as well. I consider this class to have displayed this element brilliantly. I found insight and inspiration in many of the discussion board posts that I had the pleasure of reading and contemplating. The teamwork that was assigned was some of the more pleasant experiences that I’ve had to date as well. Overall I looked forward to engaging with Mr. Tresser, my classmates and the content throughout the entire term – not a claim I can honestly make for all my courses and presentations. Thank you for teaching this class: in a world of sooooo much apathy and cynicism, it is refreshing to have a class dedicated to getting people involved. At first, I was a little scared of the class because I had no idea what to expect. I thought for sure I’d fail! You were a little intimidating at times, which is funny since the more you interacted, the nicer and more interesting you seemed. I loved the assignments, and I loved the discussions, and although at times I got stressed with having to kind of do additional mini-assignments in the discussions, I think it was helpful and showed that you really care that we learn. I think if it is possible, it would be wonderful if part of the class involved each person ACTUALLY getting involved in a real-world current cause. For this assignment, I think it would be important to provide step-by-step instructions on how to do this, but I think that would be extremely helpful. Thanks for everything; I really enjoyed the class, and I wish it was continuing. I’ll miss it, and I’ll miss each of the people involved. Thanks to all.